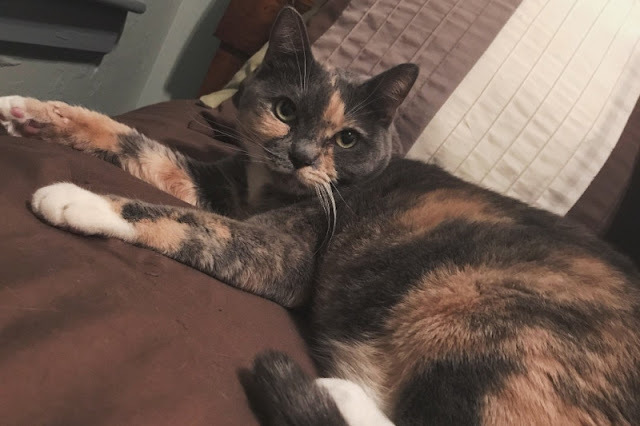 Lunabelle, or just Luna, is my 7-year-old calico. She's a spoiled brat, and is really feisty with anyone who isn't me or my mom, and I love her with all my heart. She was recently taken to the vet who thinks she might have FIP, which is an infectious disease that causes her to have excess fluid in her stomach that might make its way to her lungs. I'm not familiar at all with this sort of thing, but from what the doctor tells me the most common cause of death is because of starvation (because of the fluid in their system, cats don't eat), or drowning because of the fluid filling up in their lungs. FIP is very often a misdiagnoses though from what I understand, and we'd love to run more tests but that costs a lot of money. I don't know if this will reach a lot of people at all, but if you have a buck you don't need, please don't hesitate to donate it. It's all going towards further testing for Luna to figure out what exactly her condition is. I'm rather desperate, and heartbroken about this. If you'd like to donate, please click the image of Luna above, or the link below. Thank you so much in advance for your help. It means a lot to me. Will we ever know the long lost "Pitner Formula" ? - *VINTAGE (CDLXXXI)* Rilo Kiley - "The Moneymaker"
Nocturnal Polyp - Martin Quarz brings us this intriguing specimen of a nocturnal polyp. Thirteen and Jinx-Bernard Klein-1941 - Will need to remember these two the next time Friday the 13th rolls around. Final 5 Figures Needed for UofM Figure Guide - Only five figures remaining to reach a Master Set of 1,528 Figures. Completing the UofM Figure Guide is very much within reach. Can you help?